Rachel Pagano earns the Health Sciences Student of the Month . Rachel was nominated for the award by Health Sciences Instructor Maria Tamburro. Mrs. Tamburro notes that Rachel is an outstanding student of Health Science and Chemistry and she always works towards excellence in all academic areas. Rachel recently organized a fund-raiser to help support cancer research for St Jude's Children's Hospital and volunteered at Shoprite in Washington bagging for charity. Rachel also volunteers at Clover Nursing Home in Columbia, NJ where she is assisting the geriatric population in activities and spending time with them. Rachel is an involved member of the school community participating in a range of activities from basketball, school recruiting, and Key Club. 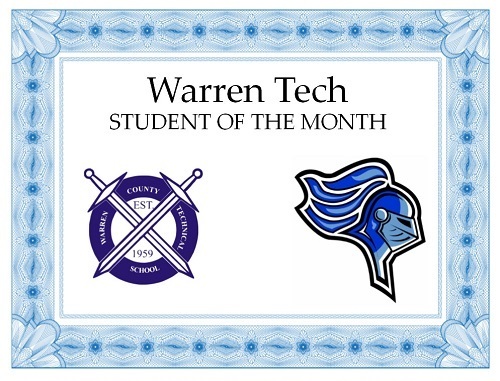 Nathanael Morris was named Physical Education Student of the Month (Male) and was nominated for the award Deb Kessel. Mrs. Kessel notes that Nathanael is an exceptional athlete who pushes himself to the limits of what he can do physically while simultaneously showing the kindness and respect of those in his class. He carries himself with honor and strives to the ultimate success no matter what he is involved. He has the best behavior toward his teachers and is very quick to understand the movement concepts we teach in class. Nate is an excellent role model for his class mates and the school. He defines the standard that all warren tech students should be held. Emily Bussard earned the School Service Award after being nominated by History Teacher Laura Goodell. Mrs. Goodell notes that Emily is a high achieving academic student who is respectful, kind, and active in the school. Emily never hesitates to help anyone that asks or needs it. She sets the bar high and is a model student.